Drakon 3rd Edition – Three Times The Tile Laying And Throat Cutting! Nearly ten years ago, a man named Tom Jolly came up with a neat little game involving laying tiles and getting on top of them with your standie. Now while some of my more gutter-minded readers may believe this to be perverse, it’s not. It’s a board game where you place tiles that represent rooms while hunting for treasure and attempting to wholeheartedly screw your opponents silly. 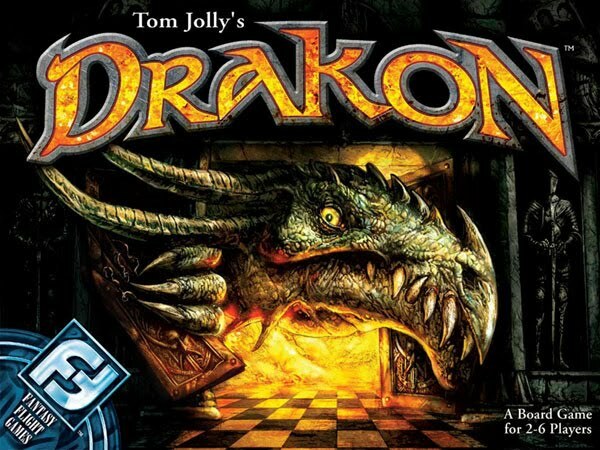 The game has been printed no less than three times, and the most recent is by Fantasy Flight Games with their 3rd Edition Drakon. As usual, they’ve updated the look, added more plastic to the box than Joan Rivers has in her face, and put it out there in a very inexpensive package. All in all, there’s simply no reason not to own this game unless you just really can’t stand games that don’t include dice or don’t enjoy games where a character may bust out a Robert Howard quote such as “the lamentation of the women”. It’s fast-playing, sometimes a bit random, but all in all is a strategic fantasy game of Screw Your Neighbor that is very replayable due to its intrinsic design. The idea is that a group of adventurers enter a dragon’s lair searching for its horde of gold and jewels. As each player takes a turn, they may take one of their tiles and place it adjacent to a previously placed tile to expand the dungeon. Almost all of the tiles have a symbol on them that performs a specific function when a character moves onto that tile, such as giving the player that steps onto it treasure, changing its orientation, moving it to another location and a host of other groovy things. Alternatively, they may move their character instead of placing a tile, which is the only way a player can activate the tile’s power. Each character has a special ability that may be used only once per game, generally, and this is usually something that is hoarded jealously until the absolute necessity of using it calls it into play by the owner. It sounds simple, but there are so many different tiles with so many different functions, and so many characters with different abilities that the game never really seems to get old. At the end, the player who finds 10 gold pieces first is the winner. Cracking open the beautifully illustrated box will find you staring down at a great many sprues of two inch tiles, each with a room’s illustration on them. These rooms are all pretty well illustrated, although I’d argue that some are spicier than others. You’ll also be faced with a sprue of gold coins with values between one and three indicated upon one side. 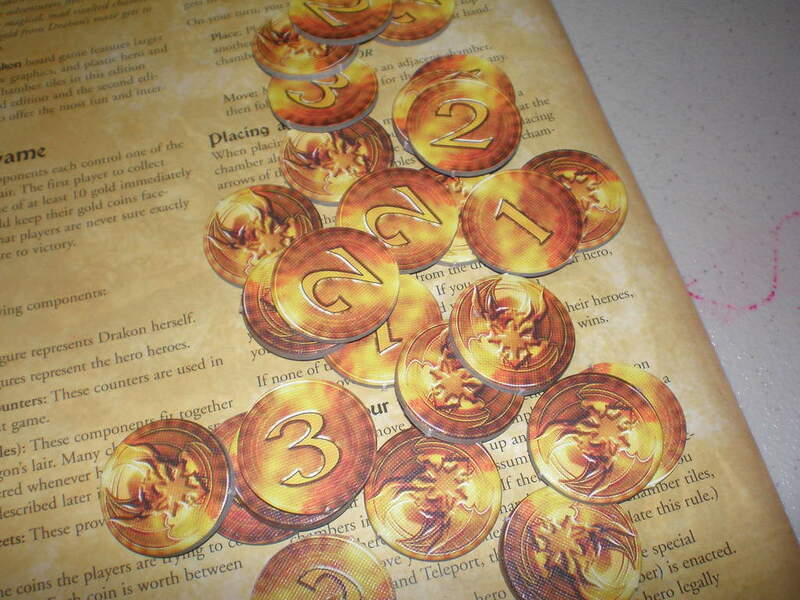 These are, well, the coin of the realm and the sole reason that the characters are messing with the fire-breathing monster’s little dungeon. Finally, there’s some “power” markers that can be used in the advanced rules that are used to remind you that you still have your special ability left to use. Beyond the sprues are a bunch of little plastic figures that are really very nicely sculpted, and although they’re not painted, they’re still different enough to discern which figure is whose. The last things in the box are a very understandable rulebook and six quick reference guides that help you decipher just what it is the symbols within the rooms actually represent. The quality is superb, and the components are all well designed and very durable, so I really have nothing to pick on here. Just based on the components, this is one hell of a great value. Setup takes such a small amount of time that it’s hardly worth talking about, but since I’m here anyway, here goes. You need to shuffle all of the tiles, deal 4 to each player for later placement, and then set the rest down as a draw pile. Next, place the “dragon head” tile in the middle of the table, which is the start space. Each player should select a character and place that character onto the start space tile. Finally, all of the gold coins should be placed face-down in a pile, forming Drakon’s hoard. Once these steps have been completed, you are ready to play the game. 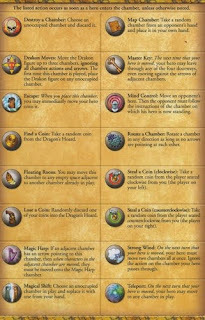 Additionally, you should probably have one of the included quick-reference guides available to tell players what each symbol does. 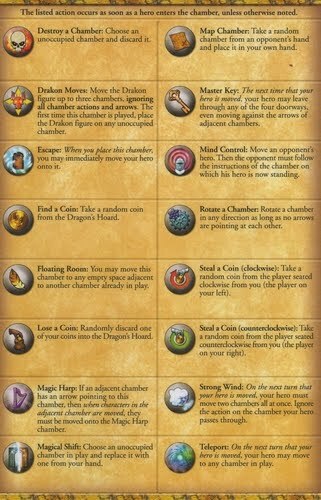 On each players turn, they may perform only a limited set of actions per turn: place a tile, or move. Each tile has arrows on it indicating which direction the players may move out of the current room, and you may not place any tile so that arrows point toward one another. Once you’ve placed a tile, there may be further action to take, such as placing Drakon into the game or moving your figure onto a played Teleport tile. After you’ve completed your placement, draw a replacement tile and put it into your hand. Movement is very simple as well, simply move your character onto any adjacent tile that is allowed by the arrows on the tile your figure is currently on. Some characters have special powers that allow you to bend some movement rules, but in short, this is all the gameplay Drakon allows. As you can see, Drakon sounds really simple, and it mostly is, but when the tile powers start coming into play, you start to see some serious strategy forming. Certain tiles allow a player who steps on them to steal a coin from an enemy player, some tiles are that allow you to move against arrows, some tiles cause other tiles to rotate, some tiles allow you to instantly teleport onto them when placed, some allow you to move two spaces instead of one, some tiles allow you to control a player that’s not your own, and many more powers. All of these are simple to understand and execute, so it’s not a big deal, but the strategy becomes increasingly complex in correlation to the amount of tiles that have been played. Placing tiles like the Magic Harp, which draws characters onto it from adjacent spaces, is just one of the ways this game allows you to completely hose over your opponents. Another way is to place a Destroy Chamber tile in front of your character and then step on it the following turn in order to destroy a connecting tile and trap an enemy or two somewhere that they will either be stuck or will need to spend his tiles to try to rebuild a path. As you can see, there’s a lot of different tiles, and they all do something that changes the game. 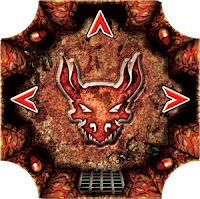 One thing to note is that if you move onto a space with the Drakon miniature or Drakon is caused to move onto your tile, you lose one random coin and must remove your character from the board and replace it on the start space. The punishment for being attacked by a fire breathing dragon is certainly not as bad as I would expect, but it’s effective to stop opponents from getting a win. In the end, this game simply has you traipse along the brimstone path, placing tiles or moving your character until one player proclaims that they have ten coins’ worth of gold. Some games last five minutes where others can last for forty five minutes, depending on the amount of screwage and the distribution of the tiles. There are almost limitless ways to play this, but all force you to really try hard to screw over your opponents. It’s just a fast, fun little game that can’t be beat for the $25.00 US that I paid for it. I just can’t tell you how much of an autobuy this game is, in my humble opinion. For the money you pay for Drakon, it really fits a lot of niches in a game group, such as the “short but fun” filler game, the “what do we play when we have 6 people” game, and the “I want to be evil to my friends” game. It’s a great buy, and while not for everyone and certainly not the best game ever, I think it’s a game that almost anyone will enjoy. Previous PostThrough The Desert – Who’d Have Thought Herding Cute Little Pastel Camels Would Be So Cutthroat?Next PostIncursion – Is It Wrong To Love Crushing Nazi Zombie Skulls?